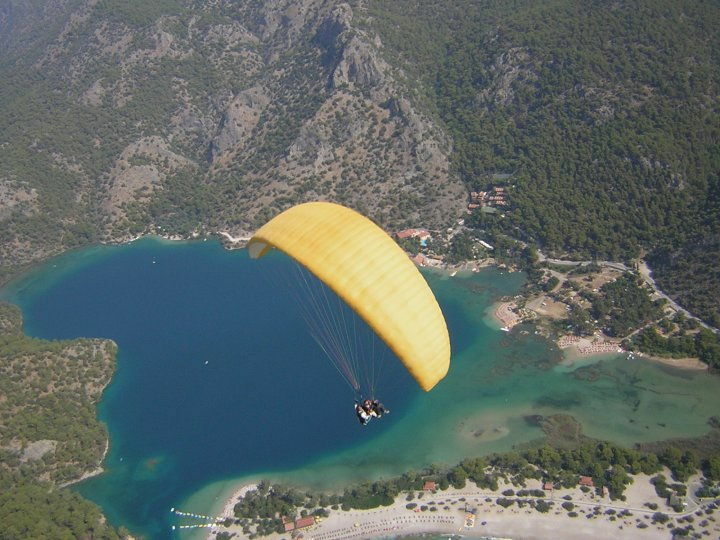 Took this whilst paragliding in Turkey. We landed on the beach just at the bottom of the photo. The photo is of my Mum! That's fantastic. Were you flying solo or with an instructor? You took this?!! It's amazing!!! That's a cracking shot. I don't think I could take such a picture though – I'd be too busying trying not to cry. With an instructor – tandem paragliding. You jump off a mountain called Babadag (translates to "father mountain") 6500 feet high and then land on the beach 45 minutes or so later. It was a crazy surreal experience! Although when I'm up high, part of my mind says 'jump off'; not in a suicidal way, more curiosity. Although it definitely would kill the cat in that case.